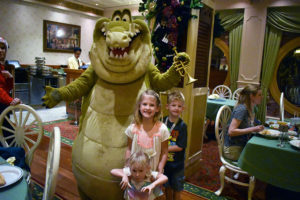 Disney has really outdone itself with the new addition of Tiana’s Place aboard the Disney Wonder, if for no other reason than the fact that a giant alligator named Louis is dancing around the restaurant with a trumpet showing off to the crowd. Seems like Mama Odin really made an impact when she told the trio to Dig a Little Deeper. 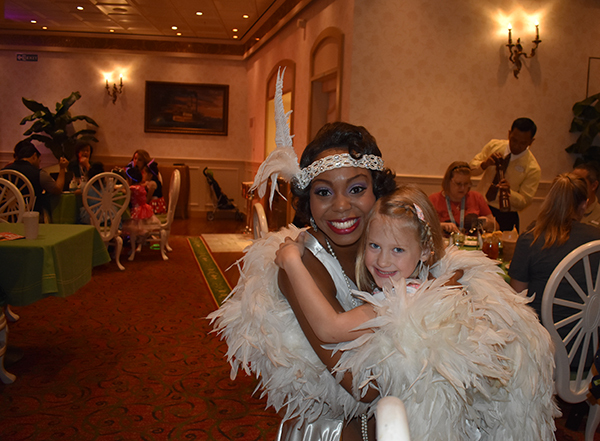 Of course, Tiana is there too, serving up her man catching beignets, plus some gumbo and jambalaya that would make any Daddy proud, plus her promised jazz ensemble. Resembling an old forgotten and abandoned warehouse, the restaurant is covered in a brick facade. Kudzoo crawls up the exterior and blossoming flowers adorn the cracks. Inside, warm and creamy hues of forest life decorate the fulfillment of her lifelong dream and proven efforts of her hard work. 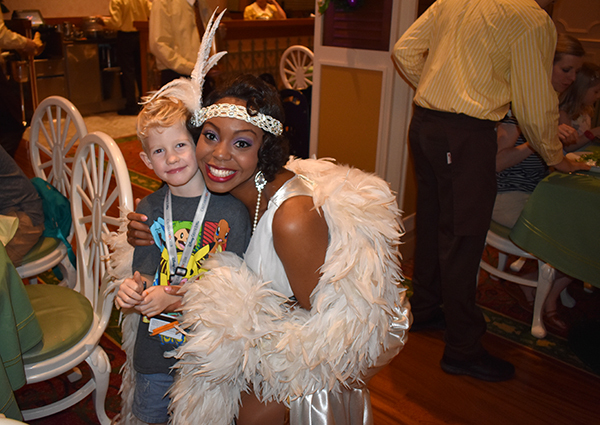 Tiana dances through the aisles decked out in a 40’s romper complete with fringe and headdress. Her feathered shawl is draped over her shoulders straight from the movie when she sings to her mama about how she is going to make her Daddy’s dreams come true. 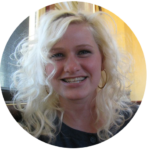 Her bright beaming smile never leaves her face and she dances and weaves her way through the restaurant greeting every single guest, entertaining them as she goes. As mentioned, Louis is there too. Full size gigantic Alligator doling on with all his charismatic southern charm. 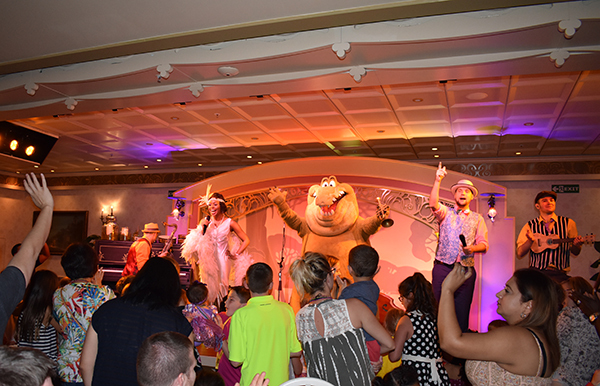 Tiana, and Louis join the ensemble on stage a few times during the night, and invite all the guests up on the dance floor to shimmy, jig and dance the night away. Mardi gras beads are passed out to all participants. It’s a jovial uplifting and night high with merriment. The best part about this restaurant is definitely the characters and the ambiance. 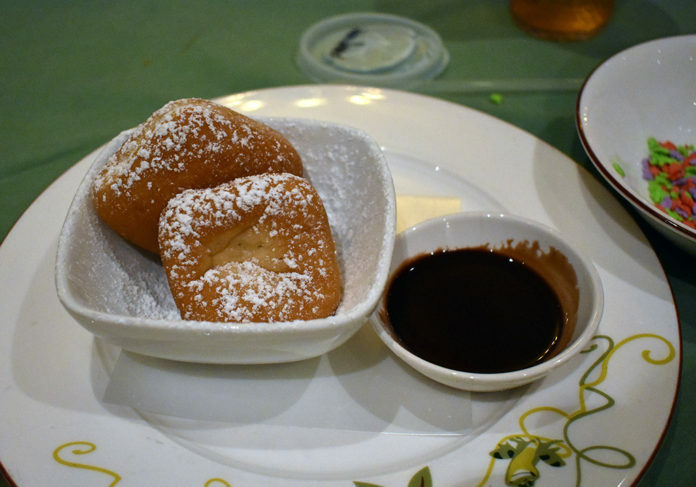 The food is hit and miss, and the beignets are kind of awful. Sadly, the mix they sell you at Café Du Monde in New Orleans is better. Plus, they are served with a coffee sauce that is so wrong and never right. 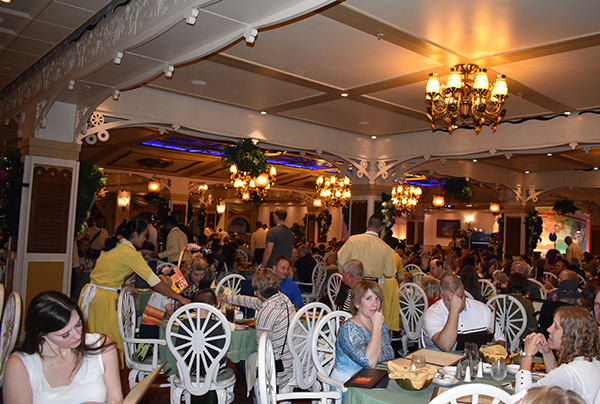 But, even still, this restaurant is a huge win for Disney and cruising on the Disney Wonder. It is full of fun, imagination, and emotion and is tons of fun! 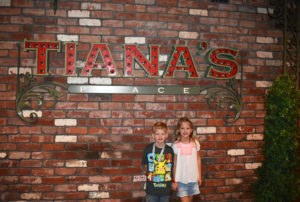 ► For Kids: Tiana’s Place is about enjoying the life you’ve been given. Dancing with friends and enjoying good food. 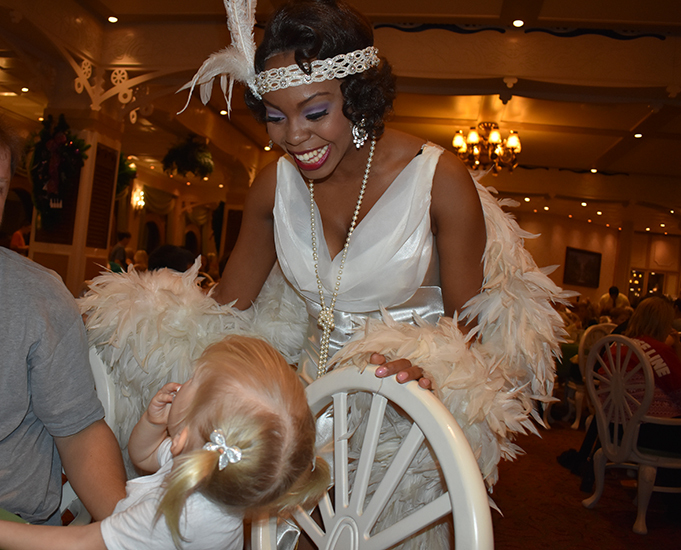 Children will love Tiana’s friendly gaze and the attention she offers them along with Louis hamming it up alongside her. Expect dancing, frolicking and tons of fun. Even though we cruised on the Disney Magic in 2016 we didn’t get a chance to check out Rapunzel’s Royal Table. It was still Carioca’s at the time, but I’m eager to check it out! Have you been? 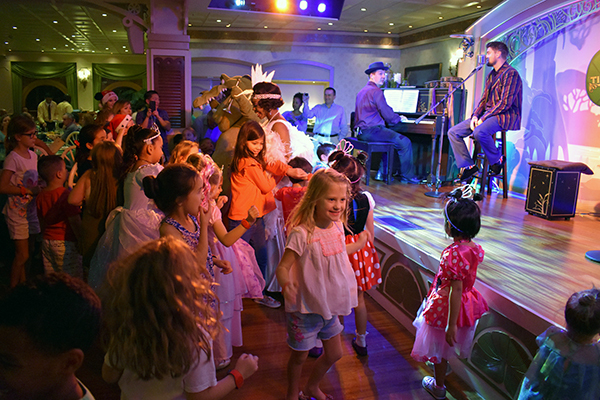 ► Nap-Time Version: Everything that makes Tiana’s Place Restaurant on the Disney Wonder so magical and special. From the brick exterior to the kudzoo crawling up the walls and the incredible ambiance complete with jazz ensemble lighting up the dance floor. Where is your ideal place to eat? Buffet? Brunch? Or Disney’s famous Rotational Dining Service? We’ve got you covered with everything you need to know.